Calgary’s nutrition experts in IBS, digestive disorders, food relationship, PCOS, & more. Healthy eating looks different for everyone. Individualized nutrition counselling from a Registered Dietitian can help you meet your nutrition goals and have you looking and feeling great. Our team specializes in a variety of areas – see how we can help you! How can we help you with your nutrition? 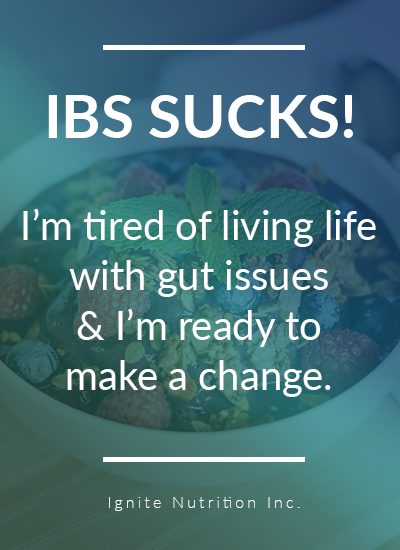 Irritable bowel syndrome (IBS) is often misunderstood and difficult to manage. We are experts at getting to the bottom of YOUR symptoms, and how to live life not so fixated on your bowels. Learn how proper implementation of the FODMAP diet can help to manage your IBS symptoms – and improve your gut health long term! Do you struggle with your food relationship or feel traumatized from yo-yo dieting? 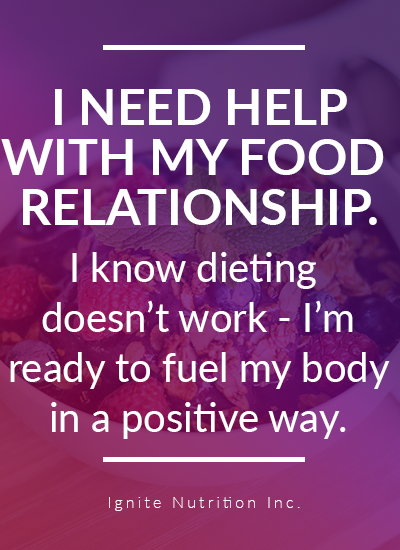 Healthy eating starts with building a healthy, normal relationship with food. Without it – achieving your nutrition goals feels next to impossible. Learn the key pillars to creating a positive relationship with food, with practical behaviour change, and mindful and intuitive eating. 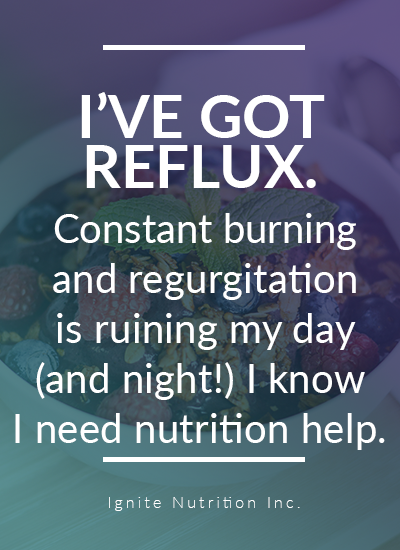 Do you struggle with reflux, regurgitation, or upper abdominal pain & burning? Have you been diagnosed with GERD, or functional dyspepsia? At Ignite we take a different approach to manage GERD – understanding that symptoms are often multi-faceted and take an individualized approach. We will look at your diet and lifestyle, and provide you realistic suggestions to get your GERD symptoms under control for GOOD! At Ignite Nutrition, we take a different approach to weight management. 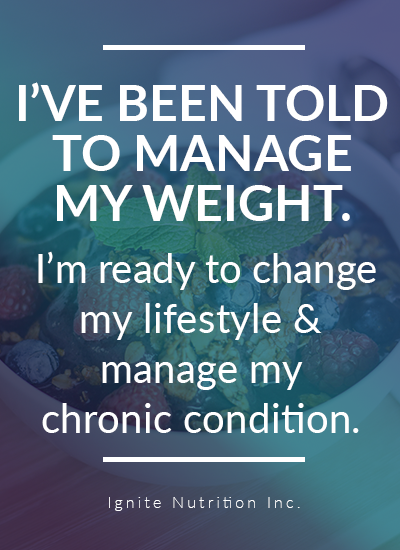 Nutrition changes can lead to better health outcomes – let’s take an approach to manage your chronic conditions that also helps you live a life you enjoy. Ignite Nutrition is ALL about practical nutrition that fits into YOUR lifestyle. We specialize in diabetes, cardiovascular disease, fatty liver disease (NAFLD) and more. Healthy eating doesn’t have to be hard. Let’s work together to come up with a nutrition plan right for YOU! 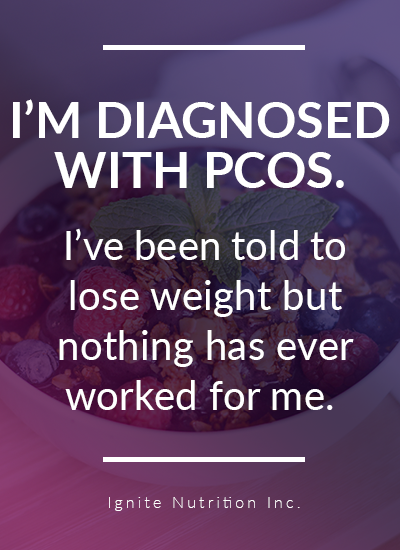 Have you been diagnosed with PCOS and been told to ‘change your nutrition’ or ‘lose weight’? What does that even MEAN? Nutrition changes can help you to manage weight, blood sugars, PCOS symptoms, and reduce risk of long term complications. A healthy, balanced diet that fits into your life, and is tailored to YOU is what you need. Are you athletic, or involved in competitive sports? Do you wonder if nutrition can influence your performance, reduce your risk of injury, and help you be the best you can be? 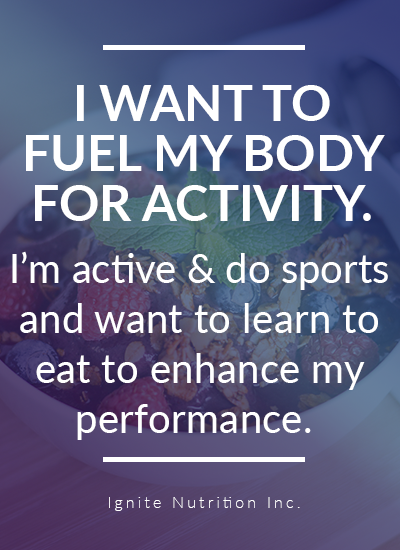 Do you struggle to know how to fuel your body best for the type of activity you are doing? Our dietitians can help. Jen Rawson is Ignite’s sports dietitian. See her today to get your sport nutrition on track!